The philosophy at The Royal Elephant is to provide authentic Thai food at value for money prices, backed up by service that is both relaxed and friendly. The second in a series of Thai restaurants, The Royal Elephant in Potters Bar is another fine example of Noyne’s excellent taste in internal decorations. It is offering an excellent menu in very comfortable surroundings, to match its reputation for quality and service. All Royal Elephants are the perfect locations for business or family get-togethers. Visit www.theroyalelephant.co.uk to view our sister restaurants in Hampton Hill and Beaconsfield. The menu includes traditional Thai dishes as well as some unusual and original dishes and an excellent range of fish and seafood and vegetarian. 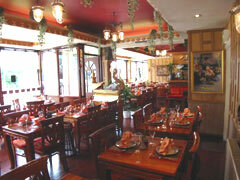 All Royal Elephant restaurants take great pride in producing genuine, original Thai cuisine. Every Wednesday you will be treated to a display of traditional Thai dancing featuring both the Chawa followed by the Phu Thai dance. We strongly recommend that you try The Royal Elephant Banquet with its selection of dishes to share and enjoy.